We can't get enough of the Losers. Today, I am featuring our Sophomore sixth man, guard John Fleszewski. John and I stayed in touch throughout college. He is a proud grad of Northern Illinois University (Go Huskies). Thanks to the wonders of the internet and the intrusive world of Facebook, John and I have reconnected a bit. He is alive and well, still living in the greater Chicago area. Again, despite the graininess, I love the picture. On the right is Greg Nessinger, trailing the play, but always ready for action (in other words, playing defense when the ball is stolen or the shot is missed). John is making a nice move, worthy of comparison to Pistol Pete Maravich. Look at how he is splitting the defenders. Simply poetry in motion. John Fleszewski (with ball) and Greg Nessinger (black shirt on right) in Mt. 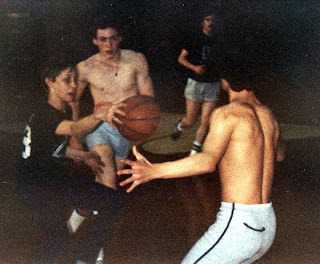 Carmel gym in Chicago, IL-Spring 1983. Again, remind the readers, the name Losers is used kinda of like calling a fat person, slim, or a tall guy shorty. Or like when someone makes a stupid comment, calling them a smartaleck.